The Bug Butcher ($3.99) might have been released on PC earlier this year, but it felt like it was built for mobile devices. The horizontal Super Pang style, the limited amount of buttons — it gels well with the endless approach for many similar mobile games, but The Bug Butcher has a level of sheen that a lot of those games sorely lack. There’s also lots of room for colorful character designs, a tight control scheme, and some silly, funny writing that tie it all together. It looks and acts like a cartoon, and you’ll uncover more and more layers of depth the more you play, which is the telltale sign of something you’ll want to play beyond an initial curious play session. Developer Awfully Nice Studios did a great service porting this over. 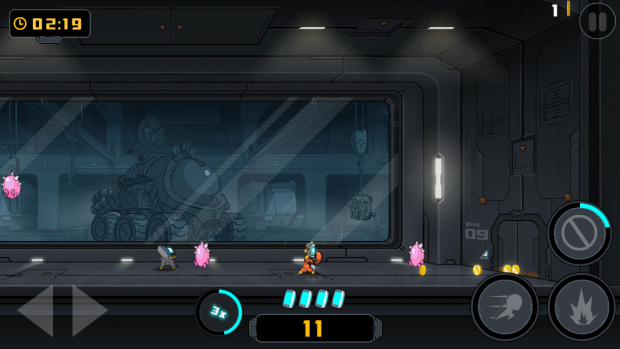 As you could probably glean from the aforementioned description, The Bug Butcher is a level-based arcade game that tasks players with blasting bugs in horizontal settings. 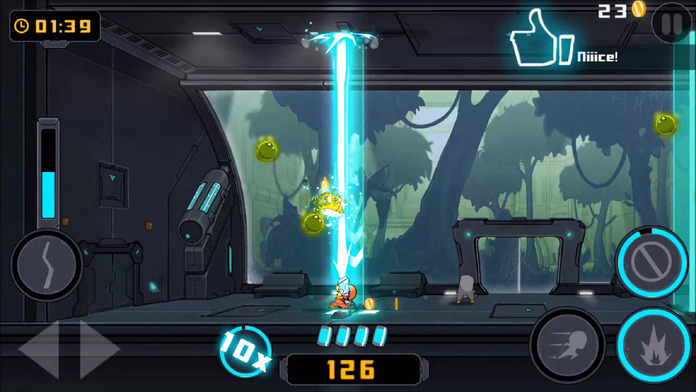 Said bugs will typically drop from the ceiling, then bounce around the arena, allowing players to dodge them with a swift left or right tap by way of an on-screen d-pad, or by queuing up a dash ability with its own separate button. Add on an attack button for your main gun and a power-up prompt and that’s basically The Bug Butcher in a nutshell. Think “flat Super Crate Box" and you’ll have an even better idea. Of course, more will unfold over time. New enemies and additional hazards pop up and change your entire gameplan, and they come in at a brisk pace across the 30 levels on offer. And it’s a little more than “adding a few spikes" as the themes and entire look of the stages will change, sometimes requiring players to meet certain objectives like protecting a VIP or taking down a boss that employs new tactics and a mixture of others you’ve seen before. Said themes are also ingrained into the arena, like ice and fire gimmicks that translate to new weaponry. You’ll have to adapt to all of the tools you’re given at the start, because while upgrades are available, the idea is that you’ll continue to utilize your standard gun and dash to work your way towards victory. It’s refreshing in a sense because you won’t need to play for hours on end to upgrade yourself to become formidable — it’s all already there from square one. Nothing feels haphazardly placed, too. Enemy patterns feel calculated, to the point where they aren’t rote exercises, but also aren’t randomly generated or unfair. Enemy placements are quick but mostly telegraphed, so there isn’t a feeling of despair when something drops on top of you. The whole wave-based approach not only feels old school, but also takes a sensible concept of bite-sized levels and meshes it with the mobile platform, which worked out really well in the end. The sound design is also off the charts. Everything sings, like it was straight out of an existing cartoon that was simply translated into a video game. It’s the same thing for the “Panic" mode that doubles as an arcade-like endless gametype, which should augment your playthrough beyond your quest to take down the entire campaign. The soundtrack in particular deserves a standout mention, mostly because it does a great job of pumping you up for the next score run while staying true to the sci-fi theme of the game. Speaking of scores, leaderboards are in, as are new outfits if that’s a thing you want. I know hearing the idea of outfits in a mobile game is probably a red flag, but don’t worry, the premium pricepoint here is actually premium, in that you’re getting everything you paid for with one purchase. In the end I kind of wish there was more game here, because said 30 levels can run out really quick if you’re marathoning it. That isn’t necessarily a knock on The Bug Butcher per se, but it did feel like the developers wanted to give us at least a little more of a taste, like a new theme or boss. If you’re big on score-attack games with a load of personality, The Bug Butcher should probably be your next go-to. It had a lengthy journey through an Early Access period on PC, but the juice was worth the squeeze, and now you can enjoy it on a mobile device with a near 1:1 re-creation (sans co-op), and all of the advancements since.